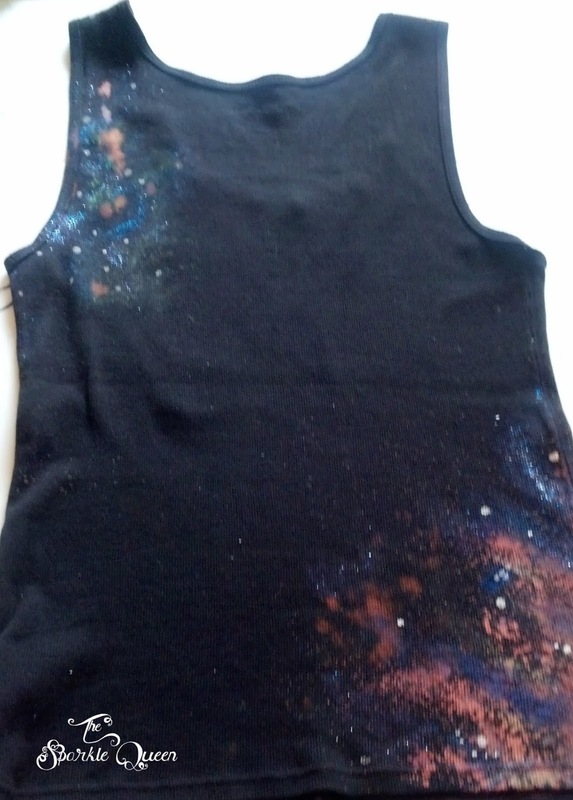 I have gotten a TON of requests on Pinterest for a tutorial for my DIY galaxy tank top with a hidden TARDIS. Unfortunately, when I was making it, I wasn’t planning on doing a tutorial for it, but I still took pictures of how I was making it for future reference. I’ll share what I have below, and do my best to explain how it made it. First things first, cut up a paper bag and spread it out over whatever surface you are going to be working on. 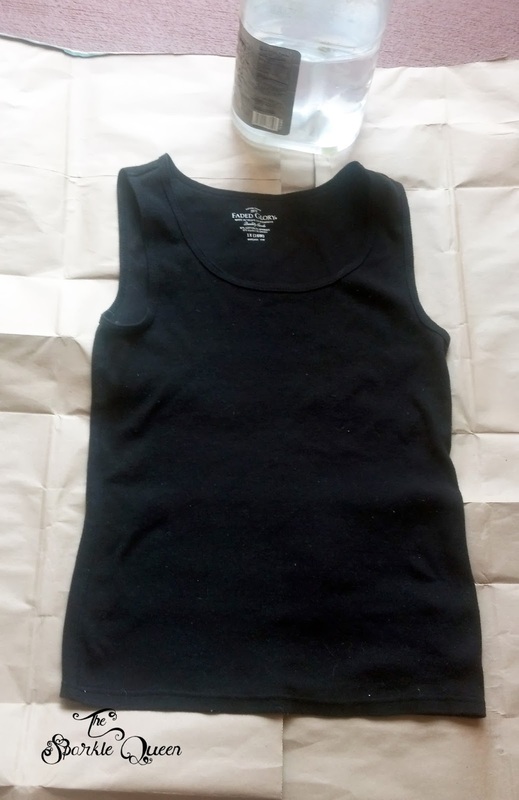 Lay out your tank top to make sure it fits and you have some extra coverage on the sides. Things are going to get messy! I worked outside on my patio floor, so I didn’t have to worry about smells or making too much of a mess. If you are doing this inside, I’d work in the bathroom or kitchen floor area just to be safe. 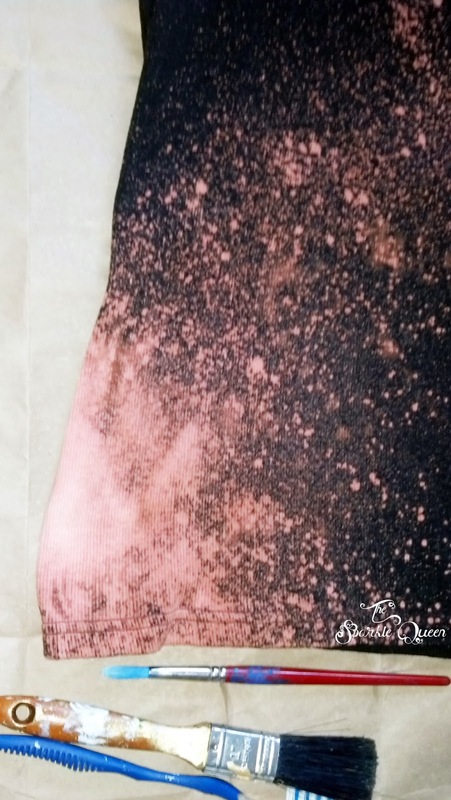 Using a spray bottle, mix water and bleach together. The ratio is up to you. I opted for a weaker ratio (1 part bleach to 3 parts water) so that way I could control how much color distortion I was getting. Spray your shirt to your liking. I let it sit for about an hour, rinsed it and hung it up to dry. If you are happy with your results carry on to the next step, if not….. I wanted to create some areas with a more concentrated bleach effect, so I went back and only added bleach to the areas I wanted it. Let it dry, rinse it out, let it dry again. And started to practice painting the TARDIS. Don’t over think it, at the end of the day you already know it’s basic shape and color, so the hard part is over. If you are struggling with the shape, google how to draw a cube, and adjust the proportions to get the rectangular shape to help get started. I used old plastic tops to practice on. Start sponging! Now this part is totally up to you in so many ways. Use whatever colors you’d like. 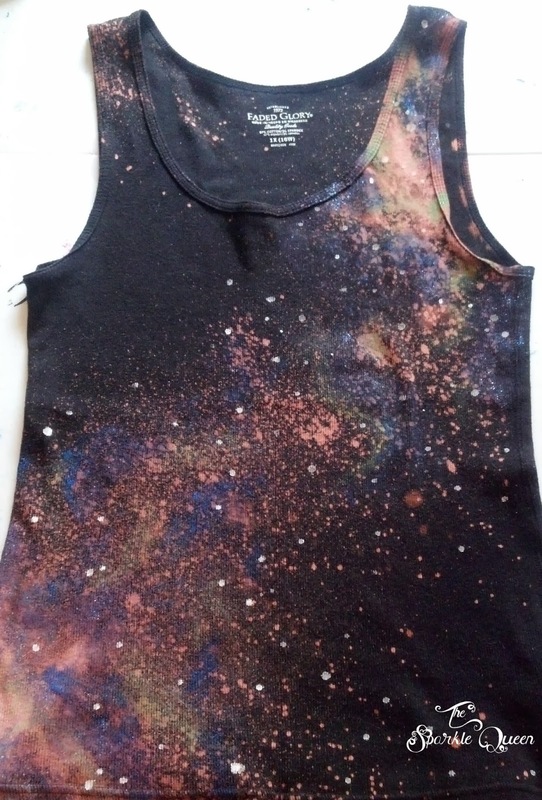 I used acrylic paints because that is just what I had on hand, but you could probably use fabric paints too. Using old plastic container tops, I put a little dab of paint on it, used a makeup sponge and dipped it in. TIP: Build up your color. You will likely spend WAY too long over analyzing where and what colors to use. So save yourself the stress and just use LIGHT coats of color, almost so light you can barely see them. You can always layer it up (which will give it dimension) and go back later to rework any area. Keep working until you are happy with the results. 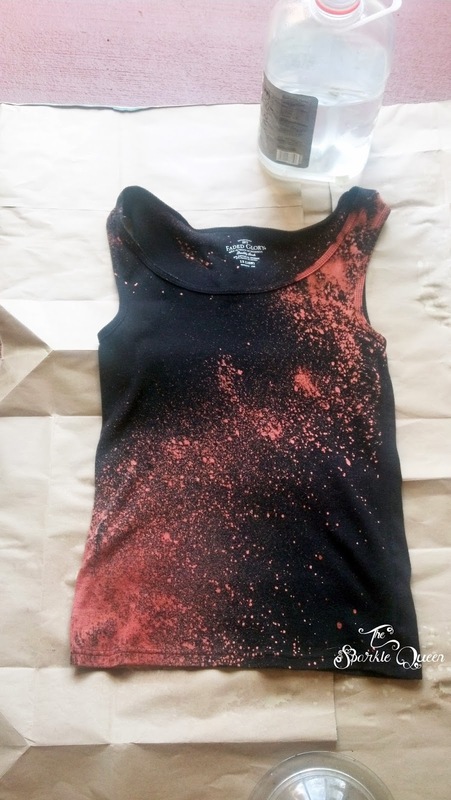 I did one half of the shirt, waited for it to dry (again!) and flipped it to do the other side. I used Q-tips dipped in white paint to create larger white dots on the shirt. 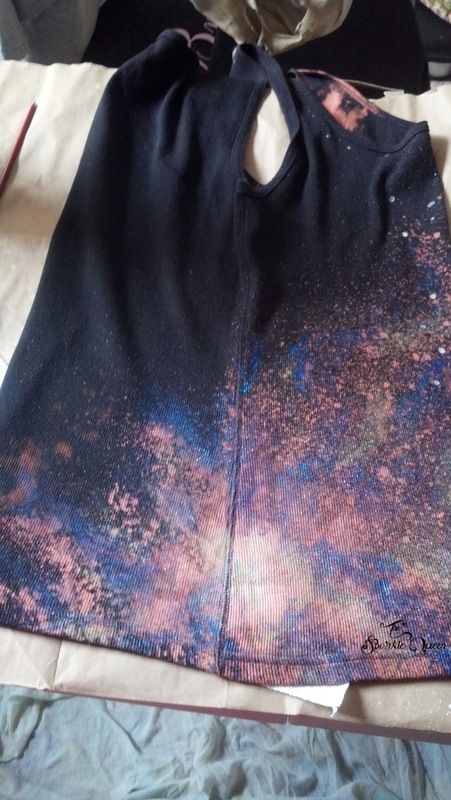 I think they add a little pop of brightness, and look like faraway stars. I also used an old toothbrush and lightly dipped it in white paint to create the speckled “tiny star” effects. 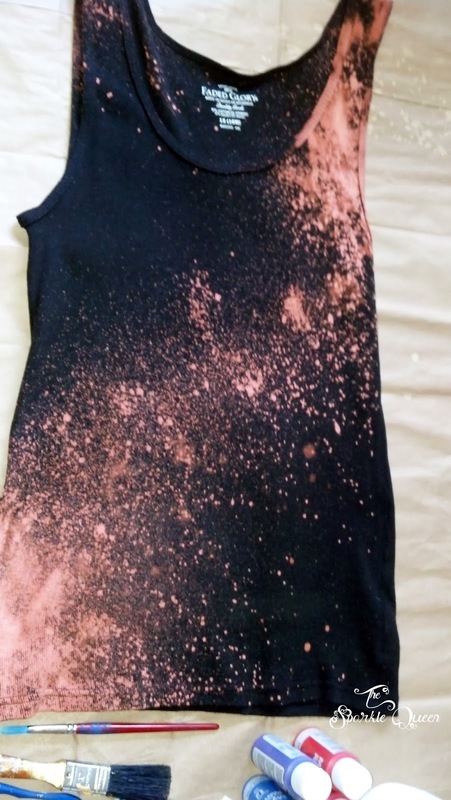 Practice the splatter effect on something else before you get to your shirt until you know what type of consistency you are going for. 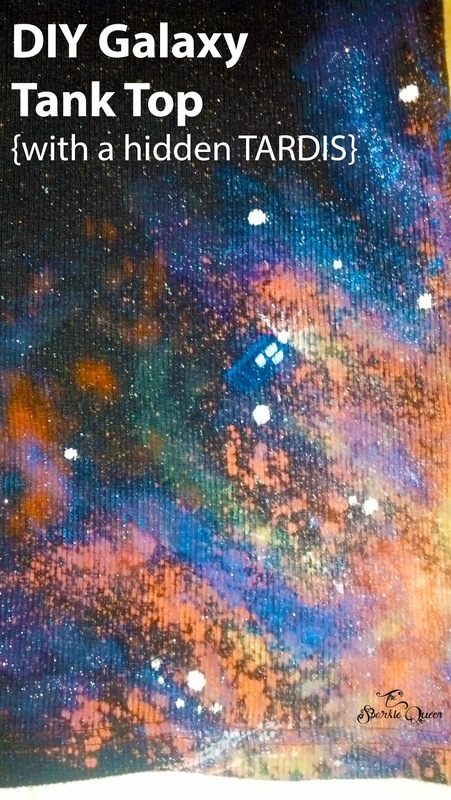 Paint in your TARDIS. 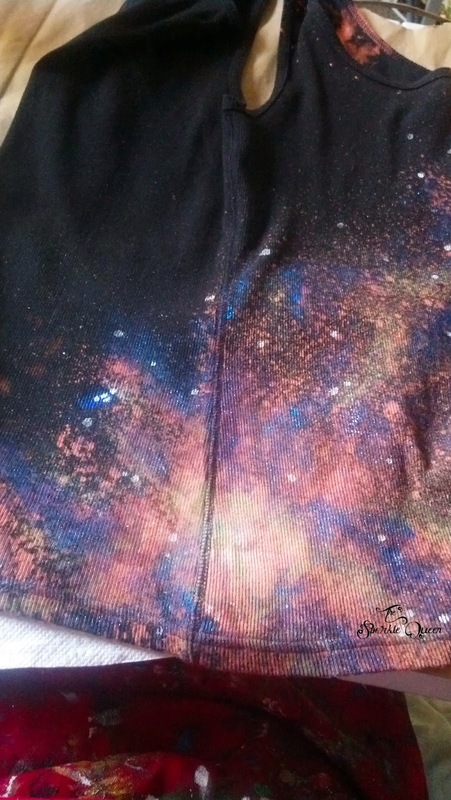 On my tank top, I choose to put the TARDIS on my lower back, to the right. It looks as though it is flying into the galaxy. Of course, you are welcome to put yours anywhere, and make it any size you’d like. 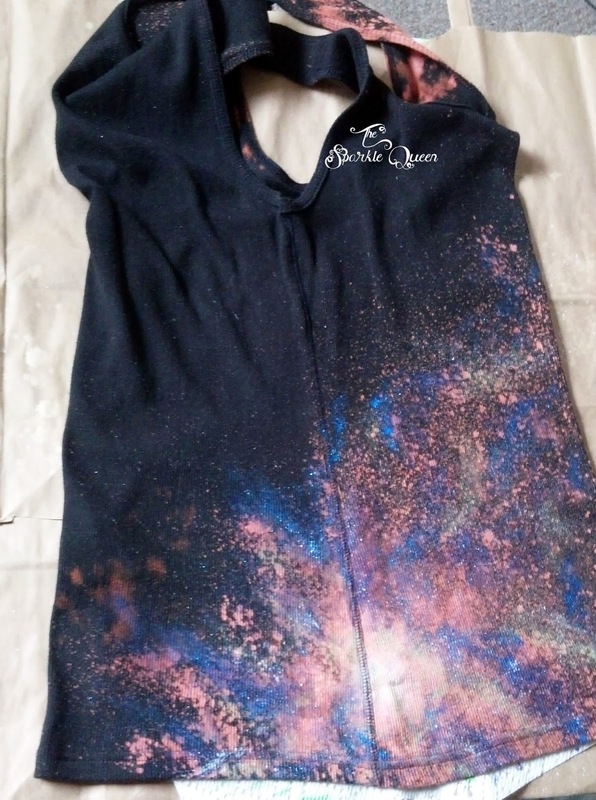 I hope you enjoyed reading how I made this galaxy shirt! Don’t get frustrated, it will come together, just keep at it. Also- I’ve worn this shirt several times, and it has gone through the wash with no issues. I hang dry it, just in case, but so far, it looks great and has minimal fade. Are you going to try and make this? Let me know if you need any help! This is amazing! How do i keep the color from fading? ?